The northeastern states have condemned the bill ever since it was proposed by the BJP-led government, followed by Lok Sabha’s approval in January. 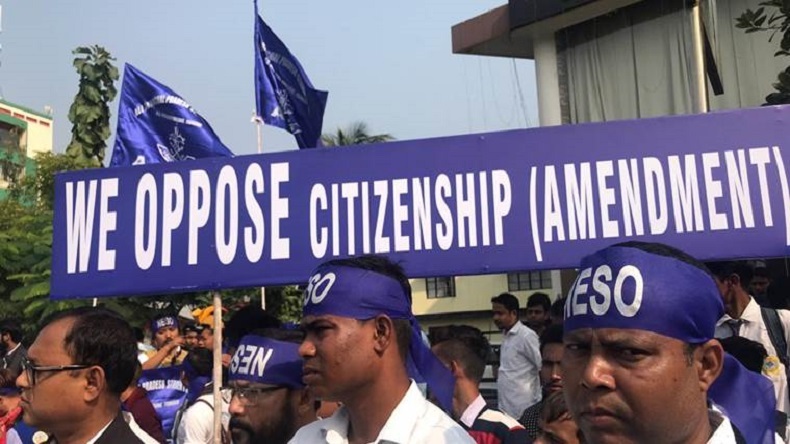 The states of Meghalaya, Mizoram, Assam and Manipur have displayed widespread anger against the bill that aims to amend the 1955 citizenship law. Post the amendment, the modified citizenship law will grant Indian citizenship to Hindus, Sikhs, Buddhists, Jains, Parsis and Christians who escaped religious oppression in the neighbouring countries of Pakistan, Afghanistan and Bangladesh. The people who have entered the Indian borders before December 31, 2014, will be permitted Indian nationality. On concern and protest raised by civil society groups, Rajnath Singh earlier said that the burden of persecuted immigrants must not be bored by Assam only, hence the rest of the country should also give refuge to these migrants. While debating in Lok Sabha previously for the bill, Singh had said that the Indian government would try to help the people of Assam in its best possible capacity as it was committed to safeguarding the interests of the northeast. Yesterday, Assamese singer Bhupen Hazarika’s son, Tez Hazarika turned down his father’s Bharat Ratna in retaliation to the citizenship bill. The award was given to Hazarika posthumously this Republic Day.